• Mean age of youngest speakers: 10-? • Published and unpublished material (of the language): Khromov, A.L. 1972, The Yaghnobi Language (in Russian), Moscow. • Competent scholar(s) and institution(s): c/- V.I. Belikov, Russian Academy of Sciences, Moscow. Several aspects of the language situation described in this brief entry are quite different from that described by the SIL survey team. The SIL team reported that there are approximately 13,500 mother-tongue Yaghnobi speakers, and that the overwhelming majority of children are learning Yaghnobi as a first language. These differing assessments may be due to changes in the language situation since the 1970s, but it is more likely due to the quality of information that was used in the UNESCO assessment. The Yaghnob valley, which is the most isolated location, as well as being the original homeland and cultural center for the Yaghnobi people. Zumand village, one of the more isolated, yet populous (population 655) villages in the upper Varzob valley. The Zapharabod region which is by far the major population center. Self identity based on speaking Yaghnobi and having Sogdian ancestry. Being Yaghnobi is considered good. Tajik for official domains, Yaghnobi for informal domains. These results show that the Yaghnobi communities are maintaining a strong positive sense of self identity, contact with the majority (Tajik) community remains fairly low, and very few people are fully fluent in Tajik. Most importantly, Tajik is only being used in domains where it is required for communication with non-Yaghnobi speakers. The article goes on to assess the status of the Yaghnobi language according to eleven factors known to affect language shift (Grenoble and Whaley 1998). The factors are marked positive if they indicate linguistic vitality (not language shift). The total population of 13,500 is well above 3,000, the typical critical level for Asia (Grimes 1986). The Yaghnobi are distributed among a relatively small number of concentrated communities and tend to live in homogenous neighborhoods which decreases outside language contact. The only negative factor is that the communities in Lower Varzob and Zapharabod are close to urban centers which increases contact with Tajik. Both parents in most families are Yaghnobi speakers and are transmitting the language to their children. Another positive indicator is that first through fourth grade textbooks on Yaghnobi language and culture have been published and have been used in the schools in Yaghnobi communities1. In addition, Yaghnobi has a high regard throughout Tajik society because of it’s descent from Sogdian. The attention which this has attracted from Russian and other foreign scholars has also raised the prestige of Yaghnobi. Tajik is easy for Yaghnobis to learn since it has the same basic word order as Yaghnobi (subject, object, verb) and an enormous amount of shared vocabulary. On the other hand, there is very little in-out migration. The only source of migration into and out of the community is marriage and intermarriage with Tajiks is quite low: 12% in a community with high contact with Tajiks, and 2% in a low contact community. Contentment and commitment to existing social networks among Yaghnobis is high, although the younger generation in some of the communities is more willing to form associations with Tajiks than the older generation. Yaghnobi people take pride in their Sogdian heritage. The injustice of the Soviet forced migrations in the ‘70s has left them feeling that the outside world owes them reparation. The government has given official recognition to the Yaghnobi language and allows Yaghnobi to be taught in elementary schools . 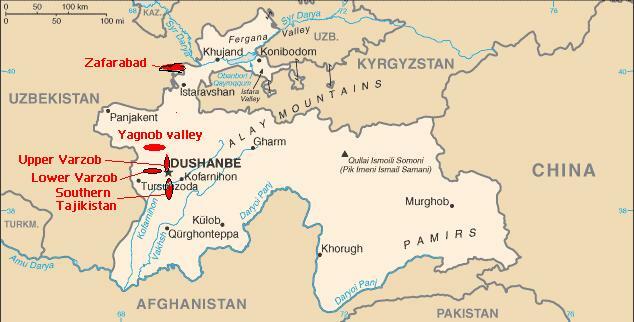 The isolation produced by the rugged mountains surrounding the Yaghnob valley and the upper Varzob discourage in-migration and limit contact with Tajiks. Although classes about the Yaghnobi language have been taught in elementary schools, the classes were taught in Tajik. On the other hand, literacy in Tajik is easily transferred to Yaghnobi since both languages use the same orthography. The vast majority follow Sunni Islam which is the same religion as the majority population. In addition, surveys show a consensus that Tajik or Persian are the appropriate languages for religious literature. Economic pressures have not produced significant migration to Tajik speaking communities2. Rural communities practicing subsistence farming only need to know rudimentary Tajik to sell their surplus in neighboring Tajik communities. Radio and/or television are available in most Yaghnobi communities. Frequent, positive references are made to the Yaghnobi. While the majority of programming is in Tajik and Russian, Yaghnobi songs and poems are heard with some regularity. The authors conclude that since seven indicators are positive, three mixed, and only one negative, the vitality of the language is strong. This conclusion is in accord with what I observed during the three months I spent living in Dughoba, in the upper Varzob. Although, it was quite apparent that the form of language that is passed on from the parents to the children is less pure. It contains more borrowed Tajik words and grammatical constructions. The Yaghnobi language as it is spoken now, and even as it was spoken in the early 1900s (Andreev 1957), has been heavily influenced by Tajik. The majority of the nouns used in the language are borrowed from Tajik. While the verbs, pronouns, prepositions, and the basic grammatical structure remain significantly different, the effect of Tajik can be seen in these aspects of the language as well. This kind of “dilution” of the language does not qualify as language endangerment, but a discussion of the state of the language is incomplete without noting the profound affect that prolonged contact with Tajik has had on the Yaghnobi language. 1. I heard reports during the fall of 2006, that the 2nd and 3rd grade text books are now out of print and that Yaghnobi language classes are no longer being taught in any elementary schools since funding for Yaghnobi text books and teachers is not currently being provided. 2. In my opinion the economy could be a negative factor. In the mountainous areas of Yaghnob and the upper Varzob the main agricultural activity is raising livestock. In Zapharabod, it is mainly cultivation of cotton and vegetable crops. In these regions, I agree that the economy is a neutral factor. However, in the lower Varzob and Dushanbe much of the economy is dependant on employment in the nation’s capital, Dushanbe. In addition, seasonal work in Russia accounts for a major percentage of cash income. According to the Tajik government 600,000 Tajiks are employed in seasonal work in Russia (RFE/RL 2007), although unofficial estimates are double this number. Since the male population of Tajikistan between 15 and 64 years of age is approximately 2.145 million (CIA 2007), 1.2 million migrant workers is about half of the male working population. If the same proportion of Yaghnobi men were going to Russia as in the overall population, then this would have a negative impact on the language situation since it further breaks down the isolation of the Yaghnobi community and increases contact with majority languages. CIA. 2007. Tajikistan. The World Factbook 2007. Washington, D.C.: Central Intelligence Agency Online: https://www.cia.gov/cia/publications/factbook/, accessed April 23, 2007. Grenoble, Lenore A. and Lindsay J. Whaley. 1998. Toward a typology of language endangerment. In Endangered languages, ed. Grenoble and Whaley, 22-54. Cambridge: Cambridge Univ. Press. Grimes, Barbara F. 1986. Evaluating bilingual proficiency in language groups for cross-cultural communication. Notes on Linguistics 33:5-27. RFE/RL. 2007. Tajikistan Asks Russia To Accept More Migrant Workers. http://www.rferl.org/featuresarticle/2007/01/16DCD85E-E236-43D4-BBF8-94D7A59A0241.html, accessed April 23, 2007. There is a distinct lack of coverage of Yaghnobi music on the internet. I cant find anything to be honest – I hope u can change change that. “Is Yaghnobi an Endangered Language? � The Yaghnobi” was indeed a perfect post. Language? | The Yaghnobi is kinda plain. You should look at Yahoo’s home page and see how they create article headlines to get viewers to open the links. You might add a video or a picture or two to grab people interested about what you’ve got to say.